One of the great benefits of being a member of the Warren Business Association is that you have multiple opportunities per month to get together with other people who do business in Warren (normally 3 per month). This is a great time to meet new people or strengthen relationships with those you already know. Please check this page often as we will continue to update it with the upcoming event dates, times, and locations. Guests are always welcome. We hope to see you soon! Come on out and celebrate the opening of a new business in the City of Warren! We will have a ribbon-cutting ceremony as well as other exciting activities for the family! All are welcome to come out and mix and mingle with other members and guests at our monthly Evening event. We will be visiting one of our members and learning more about their business as well as others who attend. This is a great opportunity to build new relationships or strengthen existing ones in a casual and unstructured networking environment, while learning more about one of our valued members. No presentations, no commercials, no pressure. Come when you can, and leave when you need to...but we want everyone to come! You'll enjoy a relaxing time with refreshments and exciting conversation! Guests are welcome to visit for 2 meetings before deciding to join. If you want to build a great business, come join us for our next meeting of the Warren Business Association. This month, our lunch meeting will feature a special presentation on the topic of "The Power of Vision: Five Action Strategies For Taking Your Life to the Next Level" with Michael Jeffreys, Professional Sales Speaker and President of the YES Network (www.YesMidwest.com). 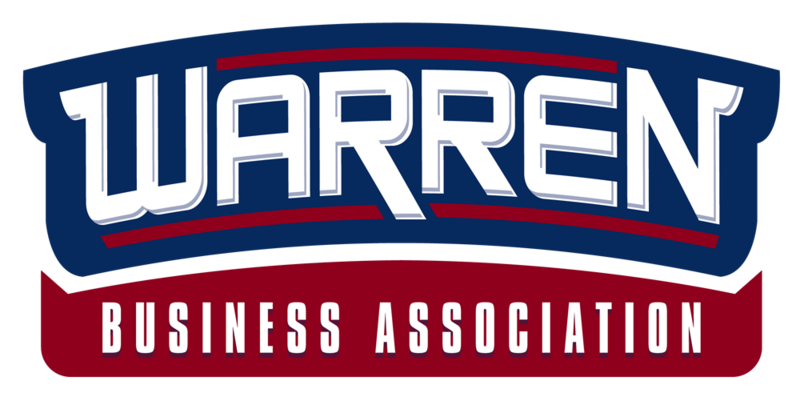 The Warren Business Association is an organization that was established to help those who do business in the City of Warren make connections with the people and resources you need! Lunch is $10/person which includes a taco buffet lunch (beef and chicken) and a soft drink. Please RSVP to be save your seat for this exciting event! In this fast-paced, motivating, and thought provoking seminar for success, Michael Jeffreys shows you exactly what you need to do to break free from your comfort zone and skyrocket to your next level. This captivating program is loaded with practical insights, original humor, inspiring examples, and actionable ideas. Whether you’re already super positive, or could use a recharge, this session will definitely change your life for the better. Michael Jeffreys is a seasoned professional speaker who has presented at more than 4000 organizations over the past 30 years. Specializing in motivation and sales training, he delivers a rapid-fire stream of ideas and relevant content. Discover how and why Michael Jeffreys has made a major impact on tens of thousands of people around the globe. April 02, 2019 WBA OPEN HOUSE! September 25, 2018 ARISE Tuesday Morning Networking Open House! September 18, 2018 Warren Business Lunch - "Think Bigger Now: 5 Things You Need to Consider"
August 28, 2018 A.R.I.S.E. and Shine! August 14, 2018 A.R.I.S.E. and Shine! July 24, 2018 A.R.I.S.E. and Shine! July 10, 2018 A.R.I.S.E. and Shine! June 26, 2018 A.R.I.S.E. and Shine! June 12, 2018 A.R.I.S.E. and Shine! May 22, 2018 A.R.I.S.E. and Shine! May 15, 2018 Warren Business Lunch - "The Cellular Industry: What's in it for you!" April 17, 2018 Warren Business Lunch - "Building a Community of Trust"
March 20, 2018 Warren Business Lunch - What is SEO? January 16, 2018 Warren Business Lunch - "Meeting of the Minds"
October 10, 2017 Business Builders Breakfast Road Trip! August 10, 2017 City of Warren Movie Night - "Secret Life of Pets"
July 18, 2017 Warren Business Lunch - "All Access Warren"
June 20, 2017 Warren Business Lunch - "What Business Are You Really In?" February 07, 2017 Evening Event - "Face Reading for Business"
September 20, 2016 Networking Lunch - "7 Lies Entrepreneurs Tell Themselves"
September 06, 2016 Evening Mixer - "Protecting Yourself and Your Business from Fraud"
May 17, 2016 Networking Lunch - "Stop Talking and Start Communicating!"